Ciudad Victoria, Mexico (CNN) -- In this corner of Mexico, people don't mention the devil by name. So if you hear the phrases "Triple X" (el Triple Equis) or "The Letter", (La Letra) you know people are obliquely referring to the warring factions in one of Mexico's most brutal drug war battlegrounds. "A Samurai draws his sword fast but sheathes it slowly," he urges the group, chiding them if they're too slow to draw their guns or too eager to holster it. "Think like an animal, act like an animal and defend yourself like an animal," he says, urging trainees to shoot using their raw instincts. "Cold blood, speed and accuracy will determine whether you live or die," he explains. In any other setting that might be a throw-away line from a shoot-em-up movie. But when there's a drug war raging on the doorstep, it's very much for real. Falcone says the biggest threat against businessmen, politicians and other VIPs is ambush and assassination followed by kidnapping. Businesses, he says, are also vulnerable to extortion given that the cartels -- like any mafia -- are diversifying from straightforward drug operations. In common with Mexican government officials and the independent Red Cross, he believes the majority of drug war victims are associated in some way or other to one of the factions and the vast minority are innocent civilians. The fight between the Gulf Cartel and its former hit squad, the Zetas, has spread across northeast Tamaulipas state and into neighboring Nuevo Leon state. According to local citizens with knowledge of drug cartel operations, the Zetas -- which translates as "the Zs" explaining why locals refer to the gang as or "The Letter" -- are firmly in control of Ciudad Victoria and south down the Gulf coast including the port of Tampico. 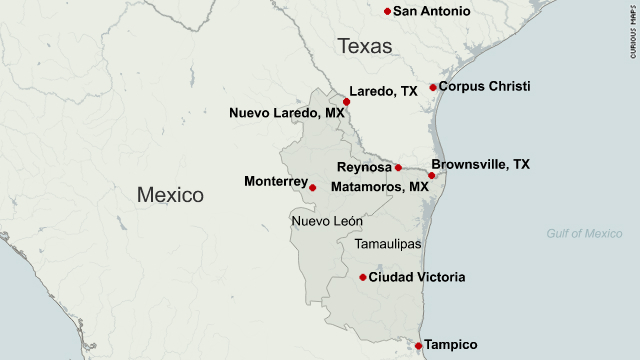 Further north the Gulf Cartel -- or the "Triple X" -- has gained supremacy, taking control of much of the border between Matamoros, across from Brownsville, Texas, almost to Nuevo Laredo. Latest reports suggest control of Nuevo Laredo is still in dispute. The industrial center of Monterrey, Mexico's third largest city, is also still up for grabs with indications that the Zetas currently have the upper hand. It's impossible, however, to draw a conclusive map. There are no frontlines in this conflict and no holds barred. According to security force officials and local citizens, the Gulf Cartel is drawing heavily on firepower from its former rivals in the Sinaloa and La Familia cartels, normally based on the other side of the country. Therein may lie the seeds of a future conflict depending on how solid the alliance proves between the Gulf, Sinaloa and La Familia cartels. It is likely to be little more than a marriage of convenience. When one of the cartels feels it is powerful enough to absorb another's business then it will do just that. All takeover bids are hostile and the mob with the biggest guns is the one that levels the playing field and anything else within gunshot. Falcone may have a better insight than most into the minds of cartel hitmen. Since 1997 he has trained around 3,000 Mexican police, mostly members of special operations and SWAT units. Later, according to government sources, many of those men went rogue and formed the backbone of the cartels' hit squads -- particularly the Zetas. "I've trained maybe 2,500 or 3,000 police and some are maybe still in the police, some have left and others may have changed sides," Falcone said, preferring not to say too much more for his own security. He believes the most ruthless killers are social misfits and probably high on drugs. "Many times the hitman is young, has no moral values and is maybe high on drugs," he said. During our trip to Mexico we sent messages through intermediaries to members of both the Zetas and the Gulf Cartel. All declined meetings or on-camera interviews. But a citizen in Ciudad Victoria with good inside knowledge of how the cartels operate said the Zetas were well-organized and had a strong command hierarchy. At the bottom are the youngest, least-experienced members known as "Falcones" - or Hawks. They earn maybe $20 a day and as the name suggests they are look-outs, informing on the movements of security forces and suspicious civilians in their neighborhoods. According to the source, these men are strictly forbidden from drinking or getting high while on duty. Armed cartel operatives are referred to as "soldiers." More specifically the soldiers seem to be divided into "Estacas", roughly translated as "fence posts" or "stakes." Their role is to provide armed backup and covering firepower if shooting breaks out. Then there are the "sicarios" or hitmen. The other weapon in any cartel's arsenal is an army of corrupt police, or other security force members. One former policeman we met in Reynosa said the Gulf Cartel was paying around $500 per two weeks to active policemen, who doubled working for the cartel. And that's the problem for Falcone and the bodyguards he trains. The drug mobs seem to have eyes and ears everywhere and its gunmen seem generally better armed than even state security forces. Given that harsh reality, Arturo Rubio, a former cop and now Falcone's training partner, injects a little humor offering some sure-fire tactics of his own: "If there's a lot of them (cartel gunmen) then run. If there's only a few, then hide. And if there's absolutely nobody then charge my valiant comrades, we were born to die."